I made this made baby quilt top on the weekend. It is pieced from some of my favorite cotton fabrics by Denyse Schmidt (Katie Jump Rope and Flea Market Fancy), Lizzy House (Red Letter Day), and Heather Ross. I quilted it and put the binding on just yesterday. The backing fabric is 5 Funky Monkeys - Sock Monkey by Erin Michaels in light green. The binding is Monaluna by Jennifer Moore in red. 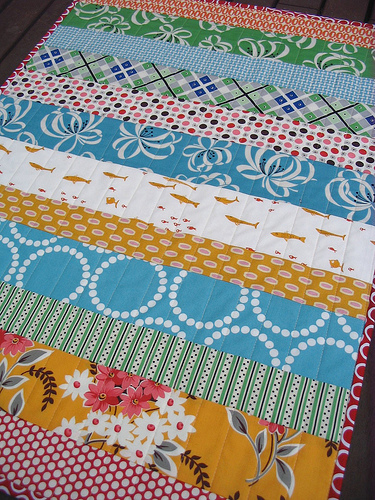 This cute baby quilt made from all cotton fabrics and batting, is now for sale in my Etsy store. What a great color combo - so fun!!! 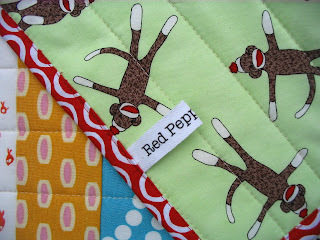 Love the boldness of this quilt Rita - especially those funky monkeys! You are one quick quilter! Your new labels look great too. What a sweet little quilt! It's adorable! Love your fabric choices! Look at you combining so many designers. You really have broken out. Very Cute! Can I ask, where did you get the great labels with your name? Another great little quilt - I'd like to know where you get your labels done, too, please, Rita! what a great strip quilt!! love all the fabrics you chose!